Dry skin is usually caused by something you’re doing to your skin that’s stripping away the natural oils leaving it unprotected. For most people, dry skin is not a sign of a skin condition or disease but is simply caused by harsh soaps, clothing, moisturiser, makeup, perfume, aftershaves and that long hot shower. Some medications prescribed by your doctor or provided by your pharmacist can also cause dry skin as a side effect, read the information provided or speak to your pharmacist. Dry skin can appear anywhere on your body but is more common on the arms, hands, legs and stomach. Most clients feel the patches of dry skin first, however, on darker skin, it can be more visual as the skin often turns grey and flakes. This can make people feel self-conscious and embarrassed, leading to stress that can aggravate the condition further. Unchecked and treated dry skin can lead to more serious skin issues. 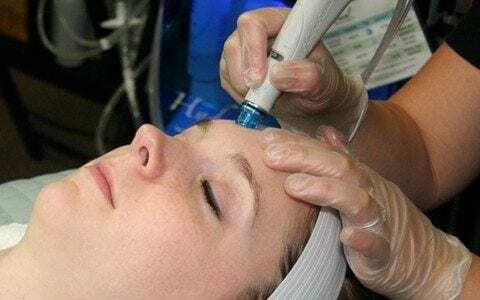 HydraFacial – is non-invasive, non-surgical procedure that delivers instant results with no discomfort or downtime. The procedure is immediately effective at hydrating the skin and encouraging the natural replacement of oils. Red LED Light Therapy – for skin rejuvenation and healing. Red light has a powerful anti- ageing and anti- inflammatory effect on the skin. Aspect Dr Facial – will also improve the texture of the skin, increase circulation and encourage rejuvenation and cellular activity.